A few years ago, my former co-worker/friend, Kim, introduced me to Parkhouse Eatery when she selected this cute, quaint location for her farewell lunch. I am VERY thankful to her for introducing us to the Parkhouse because it is truly a place of comfort, flavorful, delicious food. The five of us were the first patrons to arrive for dinner at 5:00 PM on the dot. There was no one around, and the "Sorry, We're Closed" sign was still up. The door to the main restaurant was open, so we waltzed in, chatting and looking around for a hostess. Our server popped out from the kitchen and we requested to sit outside since it was a nice, summer evening in San Diego. All pictures, except of the lobster quesadilla were taken by Tracie, the expert picture taker in the office. Her food pics were SO much better than mine! Thanks, "U"! 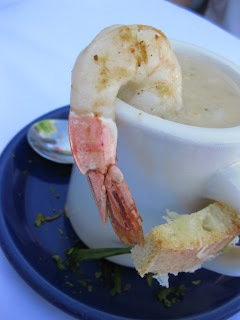 Both DV and I started off with the creamy New England clam chowder with a perfectly cooked grilled prawn. It had a little toasted bread through the handle and crispy fried scallions as a garnish on the saucer. The temperature of the soup was great - not too hot, and warm enough for a spoonful in my mouth. It was delicious. There were significant chunks of clam and cooked potatoes (not al dente) in the soup. DV and I gave it a thumbs up! 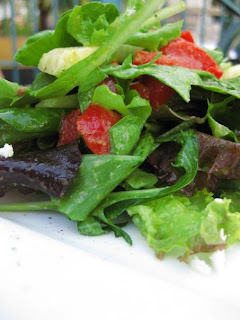 Steph ordered the field green salad with the lemon-basil vinaigrette. The greens also came with jicama and sliced sweet red bell peppers. She wanted ranch dressing on the side, but since the Parkhouse makes their own dressings, ranch wasn't one of them. She said the salad was just OK.
We received two orders of their crispy fried calamari with wasabi chili mayo and sriracha painted on the plate. The majority of the appetizer plates had sriracha on the plate for a hint of color. Mmmm.. this was by far our favorite flavor because we ended up ordering another plate! It was THAT good! 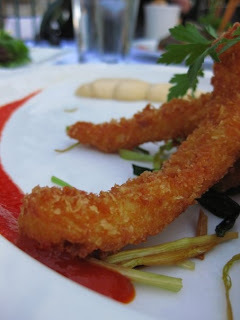 The calamari steak was cut into strips, breaded, and fried to perfection. The lobster quesadilla was stuffed with caramelized onions and spicy pepper jack cheese. Yum, it was also served with a cilantro aioli and a smoked paprika cream sauce. The cheese was very strong and salty. The quesadilla had a lot of flavor, but I didn't really taste the lobster. Still, though, a good dish, but I probably will order another appetizer than this next time. 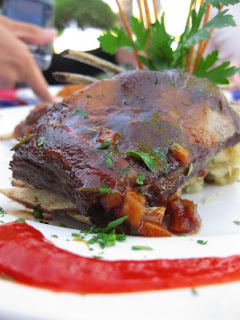 This is the baby back lamb riblets smothered with their homemade barbecue sauce and served over mascarpone mashed potatoes - mmm. This wasn't the favorite of the table, but I enjoyed it very much. The barbecue sauce had an asian kick to it, and it was very good. The meat fell off the little bone and complemented the mashed potatoes very well. 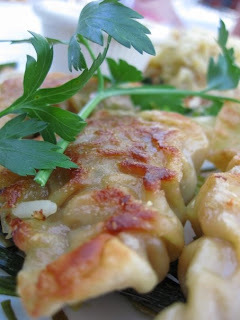 I love this picture of the pan fried pork dumplings (gyoza, I would call it). You can clearly see the sear marks on the dumplings from the pan before it was finished by steaming. The pork dumplings were served with a plum dipping sauce that was sweet and tangy to the taste. The gyoza was crisp on the outside, and mealy in the inside. It was a delicious dumpling from a restaurant not specializing in asian cuisine. However, their partner restaurant is Bistro d'Asia in Coronado. 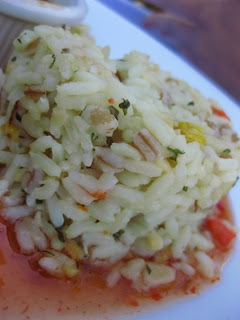 Served right next to the crispy dumplings was their take on a light fried rice on top of a splash of sweet & sour sauce. I didn't get to taste the rice, but DV said that it was "just like rice pilaf". It did look like a rice pilaf cooked with chicken broth. The crab cakes at Parkhouse is what I enjoy the most. As stated before, the first time I visited here, I ordered the crab cake sandwich on toasted french white bread, greens, tomatoes, and of course, creamy tartar sauce. The crab cakes are really delicious. They have the perfect consistency of crisp from the pan fry, and from the actual crab. 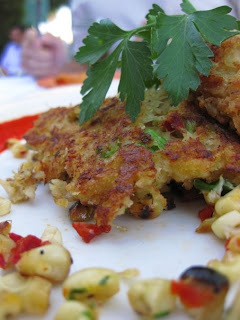 Some may argue that the crab cakes can be mushy, but I enjoyed the texture and flavor. The cakes are served with a spicy roasted corn-tomato relish and sun-dried tomato mayo which complemented them very well. Our entire meal of appetizers cost us a mere $10 per person because of the $25 restaurant.com gift certificate and the 1/2 off appetizers. We were full, had great, non-work conversation and laughed it up at the outside patio. It was a delicious way to end the evening, and to say bon voyage to DV who left for NYC that Friday. Crab cake sandwich... I will be back for you. OMG... I'm on the blog! I still love Parkhouse and go whenever I can!